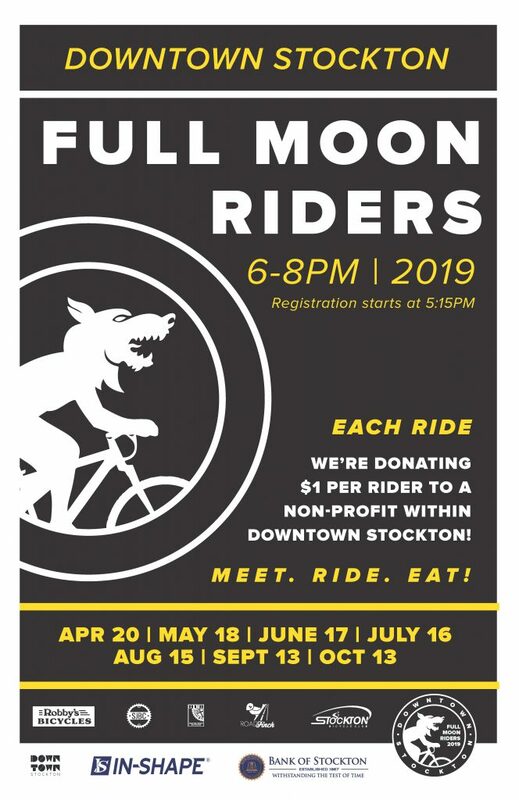 Since 2015, DSA has hosted a free, casual bike riding event series – Full Moon Riders – in partnership with community bike groups and bike enthusiasts. Meet new people, enjoy the downtown area, and be active! Each ride begins at Janet Leigh Plaza (222 N. El Dorado St.) in Downtown Stockton, and ends at a downtown venue or restaurant, where bike racks are monitored, so riders can enjoy themselves worry-free. Every rider must sign a liability waiver for themselves and any minors accompanying them. All minors must wear helmets. Registration begins at 5:15 PM; ride starts at 6:00 PM; and event ends at 8:15 PM (unless there is a special event, like a bike-in movie or concert!). At each ride, there is a free giveaway item for the first 100 riders! Join us for the 5th season in 2019! This year, for the first time ever, we are donating $1/rider to a selected Downtown non-profit, so encourage your friends to participate! In honor of Diversity Month, DSA will be donating $1/rider this month to downtown non-profit SJ Pride Center! In honor of National Bike Month, DSA will be donating $1/rider this month to downtown non-profit the HUB! In honor of Professional Wellness Month, DSA will be donating $1/rider this month to downtown non-profit Ready-to-Work! In honor of Social Wellness Month, DSA will be donating $1/rider this month to downtown non-profit Mary Magdalene Community Services! In honor of Back to School Month, DSA will be donating $1/rider this month to downtown non-profit Child Abuse Prevention Council! In honor of Hispanic Heritage Month, DSA will be donating $1/rider this month to downtown non-profit the Mexican Heritage Center & Gallery! In honor of Arts & Humanities Month, DSA will be donating $1/rider this month to downtown non-profit HATCH Workshop!